i actually finished last week, around wednesday. but, i have not been home during daylight hours lately and so picture-taking has been not a happening thing. 1. i love the sleeves! 2. i love the yarn! 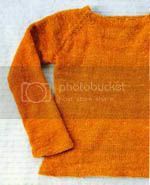 especially after blocking, this is an ultra soft and silky fabric. 3. if i were to make it again, i would alter the pattern to start the increases and decreases at the beginning of the round, not before the round starts as it does in the corrections to the pattern. just a personal preference. 4. i made the body about 1" shorter than the pattern called for. It looks soooooooo great! The color is beautiful and it looks so wonderful on you. I'm going to block mine ASAP - yours definitely looks better than mine! By the way, how did you block it?